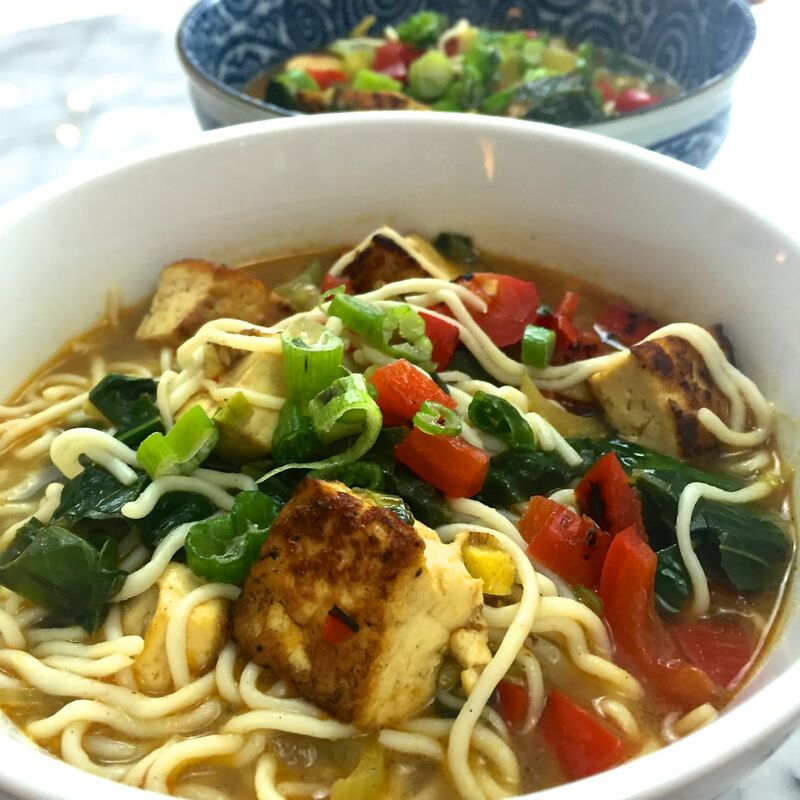 Here’s a zingy, bright low-carb coconut curry noodle soup for a grey and cold winter day (we’ve been having a lot of those lately in New York!). Shirataki noodles are something of a miracle, aren’t they? Somehow they have no carbs and very few calories. You can find them in the refrigerated section of your supermarket – usually they are by the egg roll wrappers and tofu. I find they lend themselves very well to Asian-inspired dishes, but I’d avoid trying them with Italian – they have a slight oceanic tang. I’ve used tofu for protein in this version, but you could use anything you like – shrimp, chicken, thinly sliced beef, or fish. Just make sure it is already cooked. I’ve adapted this from The Londoner. You already know I think she’s fabulous. I’ve added some lemony “roasted” and marinated red peppers – mostly because I had a pepper that needed a home, and it’s a great way to add even more color and flavor to the dish. For another adapted Londoner recipe, try cauliflower fried “rice” with shrimp, egg, and green onion. Equipment: Large wok or saucepan. Make the tofu: Heat your large wok or saucepan over high heat with 1 T. oil. Once the oil is hot and shimmering, add your tofu, salt and pepper it, and stir once to coat with oil. Let the tofu cook in a single layer for 5 minutes. Turn the cubes to brown another side, about 3-5 minutes. Once the tofu is browned to your satisfaction, remove onto a dinner-sized plate. "Roast" your peppers: Place the lemon juice and zest, ginger, soy sauce, and maple syrup or honey in a bowl. Heat 1 T. oil in wok over high heat. Add your chopped red peppers and brown them until you can see a bit of char on them (this takes maybe 5-7 minutes). Remove the peppers and add to the bowl with the lemon/ginger mixture to marinate while you make the rest of the dish. Make the soup: Add 2 T. oil to the already-hot wok. Once it is hot, add the curry paste, garlic, and chili flakes. Saute gently for about 1 minute until fragrant, then add the sliced bok choy and browned tofu. Pour in coconut milk and 2 c. boiling water. Add the marinated red pepper with all its marinade. Bring all to a simmer, then add the shiritaki noodles and cook for 2 minutes. Remove from heat, and stir in the miso (keep in mind not to boil the miso). Top with sliced green onions or chopped cilantro for garnish. Enjoy!